Twenty years after it debuted, DoveTale will be performed at Eastern Mennonite University’s Lehman Auditorium Dec. 10, 2017, at 7:30 p.m. All ages are invited to this family-friendly show which brings a humorous and poignant look into the hearts and minds of Joseph, Mary, and the Angel Gabriel as they confront the gritty realities of the birth of Christ. The performance — midway into EMU’s centennial year celebrations — comes 20 years after it debuted in Harrisonburg, Virginia, at Community Mennonite Church. It also comes 10 years after the tragic loss of Lee E. Eshleman ‘87, writer and actor, designer in EMU’s marketing and communications department, and beloved community member. Ingrid DeSanctis as Elizabeth and Ted Swartz as Zechariah will make cameo appearances. 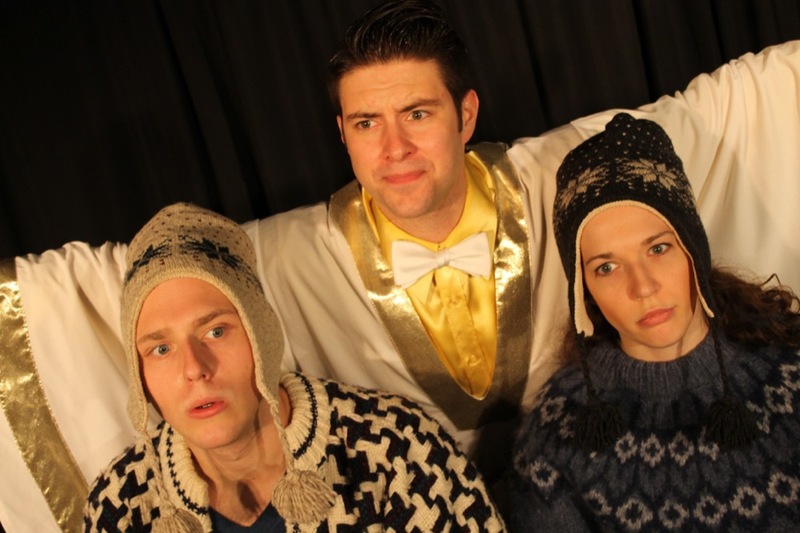 Eshleman, Ingrid DeSanctis ‘88, and Ted Swartz ’89, MACL ’92, co-wrote and produced the play. The trio performed DoveTale for 10 years prior to Eshleman’s death in 2007. For this performance, Swartz and DeSanctis will make cameo appearances as Zechariah and Elizabeth, uncle and aunt of Mary. Leading roles will be played by Lauren Zehr ‘11 as Mary; Mitchell Cole, James Madison University graduate, as Joseph; and Braydon Hoover ‘11, EMU associate director of development, as the Angel Gabriel. 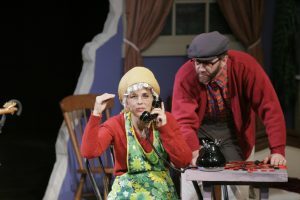 Swartz, Eshleman and DeSanctis each began their journey into theater as a vocational calling in Lehman Auditorium where DoveTale will be performed. A studio “black box” theater was named in honor of Eshleman as part of a renovation of University Commons, completed in 2011. The Lee E. Eshleman Studio Theater provides flexible theater space, hosting a variety of events each year. Pay-what-you-will entry — with a suggested amount of $15 per adult and $5 per student — and a freewill offering during the show will benefit student scholarships through the University Fund. Each year EMU grants more than $14 million in aid for undergraduate students, many of whom are from diverse socio-economic and cultural backgrounds, including first-generation and undocumented citizens. Tickets can be purchased starting at 6 p.m. in the Campus Center greeting hall (just up the hill from Lehman Auditorium). Cash, checks (made payable to EMU) and credit cards are welcome. Doors open to Lehman Auditorium at 6 p.m.
Free parking is available next to Lehman Auditorium, behind Hartzler Library and on the south side of Eastern Mennonite Seminary. See a campus map. Contact events planning at EMU with questions DevEvents@emu.edu.